Piano keyboard diagrams to print out - download these FREE piano key notes charts, blank, or with piano letters note names for your beginner music students! Let them fill in the blank piano learning guides themselves, week by week, perhaps using the new lettered piano keys layout as a reference if necessary. This printable piano keyboard shows the piano keys with the note names on them, white keys and black keys too! I have found that putting the piano keyboard sheet on students' lesson assignments every week ensures a gradual firm grasp of key names. If you choose to print out this particular piano learning guide for your students (or yourself), I suggest laminating it, or using wide tape to cover the important parts of the page! INK IS SO EXPENSIVE, and we music teachers seem to need a lot of it. I used to assign kids the entire paper to fill in the first week, but gradually I've come to assign just one note name per week, and stipulate that at home, they are to strike every one of THOSE keys up and down the keyboard every day. "This week, I want you to write in all the D's, in pencil, and play every D, etc. ", so that we keep returning to the paper piano keyboard layout week after week. It's a BIG DEAL when we've gotten through all the white keys, and turn our attention to those mysterious black keys, with the double names... still, just one new key per week is focused on with this page at my studio. Below are two very different piano keyboards diagrams: the first one has small keys (uses less ink! ), the second one is larger, with fewer keys. I use "blank" paper keyboards with all my beginner piano, violin, voice and guitar students. Yes, guitar! I write the names on the appropriate piano keys for the guitar strings - E, A, D, G, B, E - and that is how they learn to tune their instrument. It is much more meaningful than using an electronic tuner. I feel the electronic tuner should come LATER, after they understand how the piano keyboard relates to the strings and frets of the guitar. The piano keyboard is the Rosetta Stone for all musical instruments! My students get to know the key names this way: the 3 black keys are "Grandma's house," and the 2 black keys are "the dog's house." A = Ants that are hiding in Grandma's house - or it could be "A" for "Auntie". For the first few months of their lessons, they must fill in the piano keyboard paper one key-name per week. The first week they write in all the D's, and the piano players practice a hand exercise to go with it. So, all week long at home, they start their piano practice time by "dipping donuts" on all the D's. First one hand, then the other, strikes each D on the piano, from left to right, then back down again right to left (or the other way around -- some free spirit always wants to do it backwards, and it really doesn't matter! I frequently have to remind them not to stiff-handedly "splash" the donut into the milk, but gracefully bend the wrist. Over a period of weeks (and months of follow-up), it starts to become natural! It's obvious why piano players need to start learning the names of the keys, but why guitarists and other instrumentalists, and vocalists? They, too, need to understand the topography of the piano keyboard, on which there seem to be black notes "missing" between the frets B and C, and E and F.
How else will they truly understand the concept of half steps and whole steps? When I give blank piano keys sheets to guitar beginners, the first thing we do is learn where the guitar strings are located on the piano. We highlight those keys on the keyboard sheet, and use them as a reference for learning how to tune their guitar to a piano. For guitar players, I have found this to be MUCH MORE EFFECTIVE than merely tuning with an electronic device. The UNDERSTANDING is there. Next, we learn all the names of the other keys. I suggest you print out just one at first to see how you like the size. The black keys always require a lot of ink, and so these paper keyboards are precious commodities once they are printed out! I don't pass out new ones. If a student rips the holes so the keyboard sheet doesn't stay in their 3-ring binder, then I mend the edge with wide tape folded over, and punch new holes! Here are the links to the PDFs! 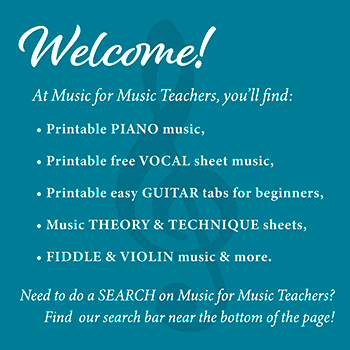 A plain paper blank piano keyboard sheet is one of the best all-around tools a music teacher has! Note-Reading Worksheets - charts with the notes placed on single staffs & the grand staff, with & without letters in the notes! This is an absolutely wonderful site! 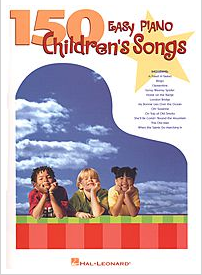 As a voice and piano teacher looking for enrichment material for beginners, I have found your collections to be comprehensive and purposeful. It is clear that you are a wonderful musician and educator. Thank you! I bought your Halloween Songs, wrote teacher accompaniment for some, and performed with 17 of my students in costume at an assisted living facility. It was a "win-win" situation. The kids and residents loved it and the parents were very pleased with the service aspect of their children's performance as well. Thank you for sharing these lovely pieces that introduce the minor key in a very simple and interesting way to early elementary students. I recently purchased your arrangement of The Moldau (a longtime favorite of mine). I wasn't sure if any of my students would be interested in it, but to my amazement 3 of my students LOVE it. Thank you so much for making your great arrangement.